Now in a handsome, hilariously illustrated new edition: The stickler-tickling punctuation polemic that has sold more than 1.6 million copies in North America is even more fun with the whimsical art of acclaimed New Yorker cartoonist Pat Byrnes. The runaway bestseller that has everyone minding their p?s and q?s (and their commas and semicolons), Eats, Shoots & Leaves has delighted audiences around the world and elevated Lynne Truss to superstickler status among those in the know. Language lovers everywhere will cheer the arrival of this new edition, beautifully packaged in a larger format with a red cloth-over-board cover and containing more than fifty vivid, full-color drawings. Created by renowned cartoonist Pat Byrnes, each illustration brings to life a different punctuation pitfall in a wickedly playful style that matches Truss?s trademark wit. Eats, Shoots & Leave Illustrated Edition is also accompanied by a colorful foreword by wordsmith extraordinaire Frank McCourt. 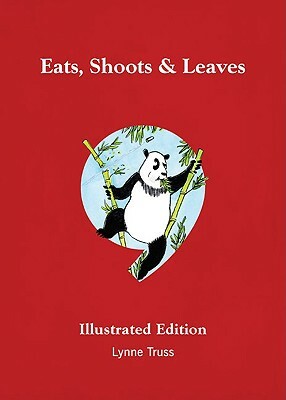 Published just in time for holiday gift-giving, Eats Shoots & Leaves Illustrated Edition is sure to be at the top of wish lists coast to coast. Lynne Truss is a writer and journalist who started out as a literary editor with a blue pencil and then got sidetracked. The author of three novels and numerous radio comedy dramas, she spent six years as the television critic of "The Times of London," followed by four (rather peculiar) years as a sports columnist for the same newspaper. She won Columnist of the Year for her work for Women's Journal. Lynne Truss also hosted Cutting a Dash, a popular BBC Radio 4 series about punctuation. She now reviews books for the Sunday Times of London and is a familiar voice on BBC Radio 4. She lives in Brighton, England.